Dead sea is a huge lake situated between Jordan, Israel and the Palestinian authority. "No bird flies over it, no animal runs by, the man who dared him to swim, dies", – spoke about it in ancient times. The lake is called "sea" because of its large size, because its length is 67 km, and a width in some places reaches 18 km. the Epithet "dead" due to the fact that the lake really is no life: no fish, no algae or arthropods. However, in later times, the microscope has allowed to prove that the lifelessness of the Dead sea were somewhat exaggerated, bacteria the water it is still there. But in ancient times about bacteria, nothing was known, so that the lifelessness of the pond seemed absolute. The Dead sea water is fatal for humans if you drink it. Tragically ended and attempts to swim across the Dead sea: the boat tipped over, and the brave souls who dared such a feat, not immediately able to reach the shore. In some cases, people then died from poisoning. So the lethality of the Dead sea water is due to the high concentration of salt in it, which reaches 300-350 ppm. For comparison, the salinity of the Black sea water is 18 ppm, and in Red – 41. For this indicator, with the Dead sea may be only the lake Baskunchak in the Astrakhan region (300 ppm), and ahead of his only a small lake don Juan in Antarctica (402 ppm). 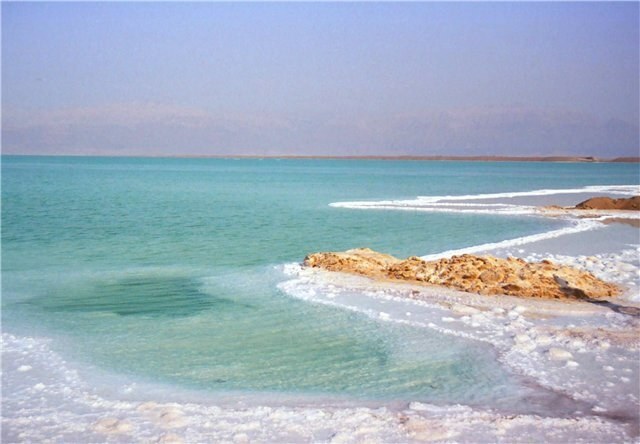 High salt concentration is due not only to the poisonous waters of the Dead sea and its density. It pushes any object, so the lake can not swim, including on the boat. People's attitudes to the Dead sea has never been confined to fear. Already in ancient times it was noticed that the water from this lake, if it correctly applied, has a beneficial effect on the human body: improves skin condition, helps with psoriasis and other skin diseases, promotes blood circulation, relieves fatigue and muscle tension. Beauties of the Ancient world, enjoy a bath with Dead sea salt, including the famous Egyptian Queen, so these baths to this day are called "Cleopatra's baths". These ancient knowledge have not been forgotten and now. Based on Dead sea salts to make different remedies for skin care: creams, bath salts, scrubs, and Dead sea attracts tourists. Salt is not the only thing that gave people the Dead sea. In ancient times, from the bottom of the lake were mined for asphalt which is used for the construction of ships and mummification, hence another name of the sea – Asphaltites. There were other names for this reservoir of Sodom, sea of Lot. According to the Bible, the lake was formed in place of the city of Sodom, which was destroyed in a rain of fire for the sins of its inhabitants, and only one righteous man named Lot was able to escape. Because of this biblical legends of the Jews and Christians will never bathe in the Dead sea and do not use cosmetics made on the basis of its salts.